Delta Light® has been working hard towards the future with a new range of innovative products. And it’s a formula that works. The Belgian architectural lighting specialist has also picked up a number of prizes: three iF Product Design Awards 2013 for its Tweeter, Boxter and Mohow models. The iF Product Design Award has been a guarantee of striking design excellence for almost 60 years. Each year, this globally recognised label presents awards to products that are exceptional in terms of materials, design, finish and other criteria. An international, multidisciplinary jury evaluated no less than 3011 submissions for 2013, split into 16 categories. Delta Light® was yet again the proud winner in the Lighting category. The newcomers to its range – Tweeter, Boxter and Mohow – will now bear the highlyprized iF logo. 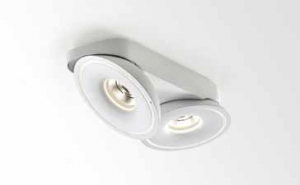 Particularly flexible, the Tweeter is available as a ceiling-recessed or ceiling surface-mounted fitting. The unique ERS or Ex-centric Rotation System (patent pending) features an asymmetrical hinge joint that enables the light to be rotated and tilted to the most extreme angles in one flowing motion. The movable inner ring allows the lighting to be adjusted to best effect in every possible situation, without cutting off any of the light. 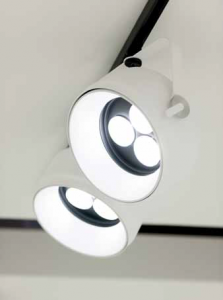 More than just amazing technology, the Tweeter also offers aesthetic refinement by applying Delta Light’s Oreo principle – an additional halo of light around the central LED – but also through the double shell housing of the fitting, which prevents the ceiling from being exposed and also paves the way for various colour combinations. The recessed version of the Tweeter is available with LED, halogen or discharge lamps, while the elegant Tweeter On model comes with single or double spot featuring Delta Light’s unique Reo LED array technology. 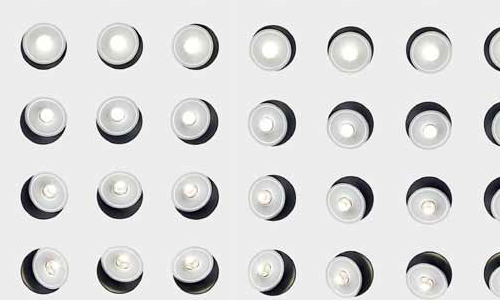 A great-looking alternative to 50-watt halogen lamps, its warm, even light consumes less than 12 watts. The Boxter model is a timeless, refined, easy-to-use downlighter with an asymmetrical design and a shape that has just one function in mind: to accommodate the control gear and still look good. It’s a shape that is also based on straight lines, designed to give every room focus and elegance. And due to the positioning of the control gear next to rather than above the lamp, the Boxter is a remarkably low and compact surface-mounted fixture. 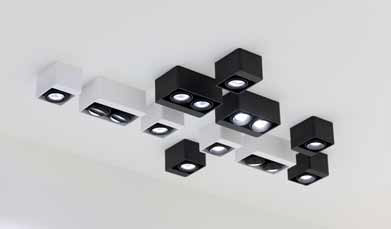 Both the single and double lamp version of the Boxter are available with either halogen or high performance power LEDs. Tiltable up to 90° and rotatable through 360°, the Mohow is a powerful and functional track spot designed for commercial applications. The slightly conical shape of its white lacquered head leads to the three central power LEDs that deliver maximum light. Delta Light’s unique Equalising Filter Technology also provides excellent efficiency, combined with an even spread of light, with no pixilation or multiple shadows. And entirely in keeping with Delta Light’s ethos, the Mohow has no visible screws or connections.